Make a special gift on a special day! 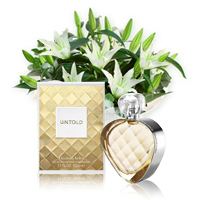 Surprise the lady of your heart by sending her a unique set of luxury lilies, and an outstanding fragrance ELIZABETH ARDEN UNTOLD. Reveal your feelings and intentions on the special day of St. Valentine! 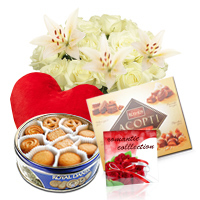 Touch her heart by sending her extremely delicious Coconut Candies, flowers, a fluffy toy, champagne together with a Red Heart, a traditional and vivid symbol of this holiday! This present will speak for itself! Your beloved lady is far away, but still you want your heart to get closer to her, then this option is just for you! Be sure that she will like these wonderful roses accompanied with different kinds of candies and a Red Heart, a traditional symbol of St. Valentine�s Day. On getting it she will feel your heart beat! Would you like to impress the lady of your dreams? This set is the right choice! A touching fragrance GUERLAIN La Petite Robe Noire won�t leave her indifferent. Wearing it every day, she will always remember you and she will hear you whispering softly in her ear: You are deep in my heart! Do you think your beloved one deserves something really unique on a special day? If so then surprise her by sending tender white roses and lilies. 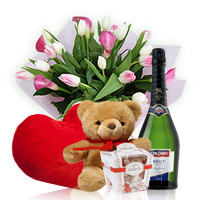 Add here chocolates, cookies and CD with romantic musi� and she will get a message of warm adoration from you! 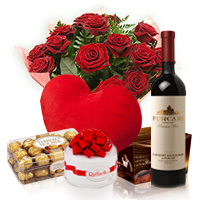 An easy way to rock her world and convey the passion to the one you love! THIERRY MUGLER WOMANITY is a legendary symbol of a strong and deep feeling. Accompanied with soft Teddy bear toy it makes a superb present for your beloved. Even being far away, now you have a chance to open your heart and your secret desires!